Doug Seven's DotNetRocks interview here: Doug Seven on Visual Studio 2010. 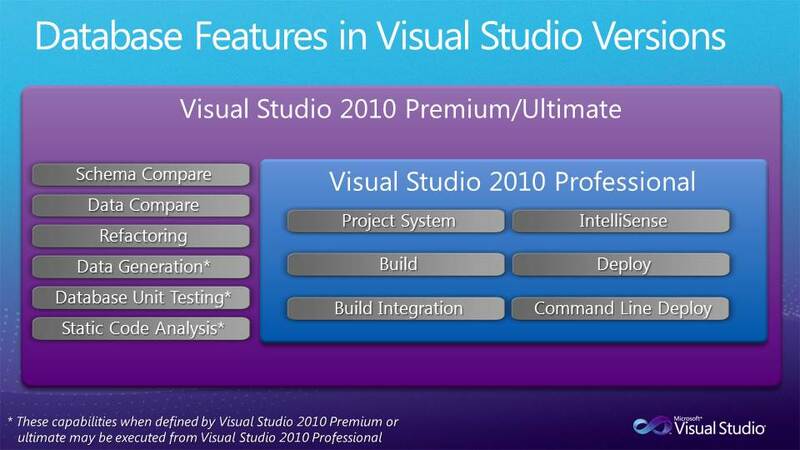 In 2010 “Team System” goes away (as a brand), and it's been replaced with VS 2010 Ultimate and Premium (VS Pro is still there). Basically VS Premium is similar to VSTS Development Edition + Database Edition (and is priced the same). Ultimate is similar to Team Suite. The functionality didn't really move down the product line (or the price point), the big different is that there's more than only DB Pro tooling in there now! Thanks to Doug "D7" Seven for setting me straight! One Response to Data Dude moving into lower priced VS Editions in VS 2010 – excellent! Good news. It will be nice to get hold of some of the Data Dude features to see what all the fuss is about! I’ve heard it rumored however that the release date for VS2010 may be put back. This may not be a bad thing as I think the aim is to get rid of a few more bugs before it comes out of beta – rather than have VS2010 quickly followed by SP1! !